Welcome from Fort Myers, FL. We welcome you to the web page of Mother of Mercy, Fort Myers, FL Chapter of Magnificat. These are exciting times that we live in and Magnificat began in 1981 for such a time as this. There are now over 100 chapters throughout the United States and its territories and in many foreign countries. Doors open at 9 am. We do not assign seats, so please arrive early. Reminder: We do not assign seats, so please arrive early to check in at the Reservation Table and find seat(s) before the program begins. Doors open at 9AM. Religious books and CD’s as well as speaker testimonies will be available for sale at the meal. Since the day is designed to speak to the hearts of women, free of distractions, it is respectfully requested that young children not be in attendance. Babysitting is not provided. Reservations are $23 per event and must be purchased in advance. No tickets will be sold at the door and we cannot accommodate walk-ins! You may also make reservations by mailing a check along with the reservation form found below. Your check will serve as your receipt. Please use this form for Mail-In Reservations ONLY. Complete the form below (include the names and phone numbers of each attendee in your group if you are paying for multiple people). Registration Form for August 31st MUST be postmarked by August 21st, 2019. Registration Form for November 2nd MUST be postmarked by October 23rd, 2019. Registration Form for February 22nd MUST be postmarked by February 12th, 2020. To be added to our Mailing List, send an email to Nancy Izydorczak at nancyizzy@embarqmail.com or CLICK HERE to visit our Chapter’s website. Our Lord definitely had a plan for this Chapter before its beginning! He set independent events in motion several years before the founding of the Chapter. Margaret Adams, Fernande Benjamin, Virginia Mc Hugh and several others in Southwest Florida were praying weekly for a Marian, Charismatic ministry to start in the Diocese. Mary Zitnik, a vocalist and composer from Chicago, had written a praise song version of the Blessed Mother’s Magnificat before moving to the area in 2000 and she became the music minister at Bob and Cristina Martinez’s “Jesus is Lord” Prayer Group in Ft. Myers. Gerry Mader and Marilyn Quirk had served simultaneously on the National Service Committee Advisory Council for several years where Lois Ann Mader was introduced to Marilyn. 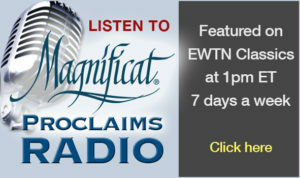 Em Weiss, Lay Spiritual Director for the Catholic Charismatic Renewal had inquired about Magnificat. When Marilyn learned that Lois Ann was moving to Florida in the fall of 2002 she casually said, “I want you to form a Magnificat chapter when you move there.” All this took place as a prelude to Mother of Mercy Chapter. After moving to Ft. Myers, the Maders were asked to serve on the Diocese of Venice Charismatic Service Team, since both had formal experience serving the Renewal. Lois Ann met with Beryl Kinney, Eastern Regional Rep for Magnificat who wintered in Florida. They invited Em Weiss to a meeting with Mimi Reilly, Bishop Nevins’ representative, to speak about forming a chapter. They were given the go-ahead to form a Discernment Team. The Central Service Team confirmed Em Weiss’ appointment of Lois Ann Mader as Contact Person for the beginning of a Magnificat chapter in the Diocese of Venice. Beryl provided Lois Ann with the names of several area women to invite to serve on the Discernment Team. Before calling, she prayed and heard, “You will have to dig deep but you will find jewels.” She made many calls with no positive response. Meanwhile, the Maders became active members of “Jesus is Lord” Prayer Group, where they met Cristina Martinez, Mary Zitnik and Margaret Adams, long-time member of the group. One evening, Mary felt led to share her Magnificat and Lois Ann recognized this as a go-ahead sign from God. She then asked Cristina, Margaret, and Mary to join the Discernment Team. They agreed and were encouraged to invite others to seek God’s direction. Our Lord’s plan to form this SWFL chapter was truly multinational. The Discernment Team came to include Lois Ann Mader, Mary Zitnik, and Virginia McHugh from the USA, Cristina Martinez from Chile, Margaret Adams from Bermuda, Rosalia Brunco from Italy, Fernande Benjamin from Canada, and Ann Doherty from Scotland. The Regional Representative was Olga Myers who provided encouragement and assistance. As the group met, in addition to studying the Magnificat Constitution and By-Laws at each weekly meeting, one member was asked to share her personal walk with Jesus and this bonded the women. They dubbed themselves, “Super Glue Sisters.” Six of them attended the International Magnificat Conference in New Orleans, LA in September 2003; upon returning, they decided to form a chapter in the diocese. While waiting for Bishop Nevins’ approval in April, Fr. Jack Smyth, a Redemptorist priest, was asked to meet the Team and to consider becoming the Chapter’s Spiritual Advisor. Much to the Team’s amazement, he asked what he could do to assist in forming the chapter and mentioned that he had dinner with the bishop every Sunday night. Within two weeks, the bishop granted his permission to move forward and appointed Fr. Jack Spiritual Advisor. In June, Em Weiss lead the Team in discerning who would serve on the first official Service Team and in what roles. Lois Ann Mader was named Coordinator. Cristina Martinez and Margaret Adams were to serve as Co-Assistant Coordinators. Fernande Benjamin became Treasurer, Mary Zitnik was named Secretary and Anne Dougherty became Historian. Rosalia Brunco and Virginia McHugh agreed to become regular intercessors. In discerning a name for the Chapter, all but one brought the name “Mother of Mercy;” once again God’s inspiration was clear. On August 22, a letter was sent to Bishop Nevins, asking him to review the Magnificat Constitution. The Chapter received approval on October 7, (The Feast of Our Lady of the Rosary). Then, off went the official letter to the CST (Central Service Team) to request the Chapter License, which was granted on November 11. Mother of Mercy Chapter was officially incorporated in the state of Florida on December 16, 2004. Aware of the finances and volunteers needed to host a Meal, the Service Team sponsored a Commissioning Mass followed by an informational coffee about Magnificat on January 22, at Church of the Resurrection of Our Lord in Ft. Myers. Approximately 200 women who were baptized in the Spirit were invited; 100 women came, some became ministry Chairwomen. Fr. Jack Smyth offered the Mass. The first Magnificat Breakfast was held on April 23, at the Holiday Inn Plaza in Ft. Myers. Beryl Kinney was the first speaker. The “Super Glue Sisters” continued to serve as the Service Team for several years. As Team members have stepped down, Mother of Mercy Chapter has been continually blessed with godly women to serve in their place. 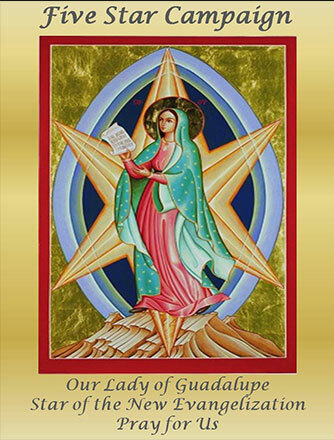 This Ft. Myers, Florida Chapter continually seeks to praise and serve God and encourage women to forge lasting relationships with Our Lord, Our Lady and each other, led by the Holy Spirit, under the patronage of Mary, Mother of Mercy.